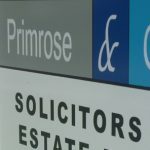 Due to internal promotion/progression Primrose & Gordon, Solicitors and Estate Agents, 1 Newall Terrace, Dumfries have a vacancy for a full time Trainee Office Assistant/Receptionist. Applicants should be polite, enthusiastic and personable. You should have the ability to write and communicate in good clear English and have good IT skills. Training in Office procedures will be given but computer skills would be an advantage. This is a permanent post with excellent prospects for career development.